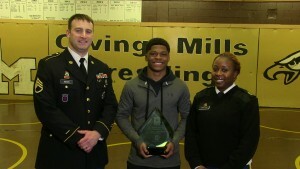 Owings Mills High School senior wrestler Tyson McDuffy has been named the U.S. Army Impact Player of the Month. 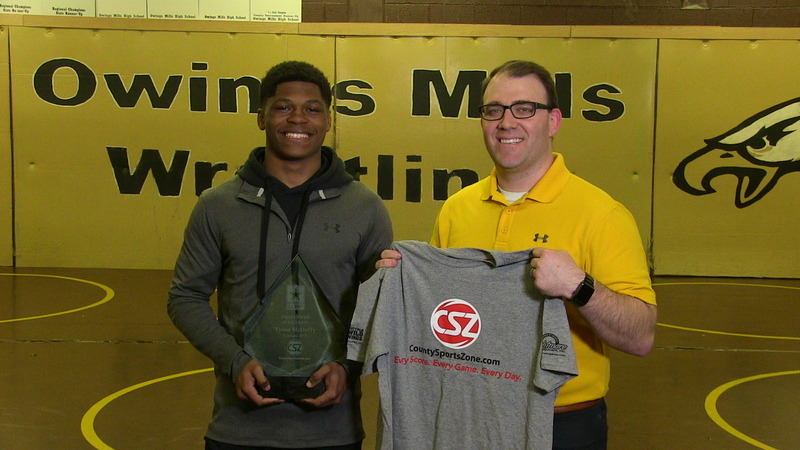 McDuffy was nominated for the award by Owings Mills wrestling head coach Shawn Girch. "Tyson is a part of Future Business Leaders of America, the school store, SGA, and he's just one of the students that every teacher looks to when they need something," Girch wrote in his nomination email. "He continues to work hard while maintaining a high level of grades and wrestling." McDuffy enjoyed a standout senior season, compiling a 47-2 record while competing at the 132-pound weight class. He won his third Baltimore County and Maryland Public Secondary School Athletic Association 2A/1A North regional title. On his way to the title, McDuffy's was tested against Dunbar's Jalen Jones during the regional title bout when he suffered a sudden nosebleed 30 seconds into the match. After an extended delay in which he had much of his face bandaged, McDuffy got back on the mat and competed, winning by an 11-6 decision. "The main thing on my mind was to keep breathing and to just keep wrestling as best I could," McDuffy said. "I didn't want to let anything get in the way of me winning that match." At the MPSSAA 2A/1A state championships, McDuffy lost in the quarterfinals to the eventual state champion, Jared Thomas, from Glenelg. He then proceeded to win four straight matches to finish in third place. As a junior, McDuffy finished second in the 126-pound weight class, and as a sophomore he finished sixth in the 113-pound competition. McDuffy's 146-28 high school record makes him the fifth-winningest wrestler in Owings Mills history. It's also the most wins in the program's history by a wrestler who had no wrestling experience before ninth grade. "I honestly first started in high school because I just wanted to try something new," McDuffy said. It was a tough transition for McDuffy though, who seriously considered quitting the sport because of how difficult it was. "Wrestling is just different from other sports because of the end results," McDuffy said. "The end results show everything in terms of what you worked for and how hard you worked. I learned you won't get anything in life unless you work for it and really want it." McDuffy served as a team captain for Owings Mills during his senior and junior years. 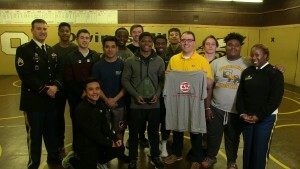 As a senior, he helped guide the Eagles to their first dual-meet regional title in five years, as the group topped Gwynn Park and Hereford to claim the MPSSAA 2A North championship. "I'm really competitive. I like to win, but I didn't want to do it alone," McDuffy said. "I did my best to bring everyone along with me. Everyone started to work harder and come together as a team. We started to win more and pick up big wins as a whole." This season, McDuffy helped guide a struggling younger teammate on the wrestling mat and in the classroom. Toward the end of the season, that teammate wrote McDuffy a letter to express his gratitude. "It thanked him for his leadership, helping him with schoolwork, and being a positive role model," Girch wrote. "This is a student that has a troubled past and since joining the wrestling team has had a huge turnaround, due in part to the guidance of Tyson." Looking ahead, McDuffy plans to wrestle at York College and study business. He hopes to become an All-American while competing for the Spartans, but he leaves behind a tremendous legacy. "Not only has he made an impact at our school, but many Baltimore County wrestlers and parents have come up to me to express their pleasure in talking with him," Girch wrote. "There is no person that I know that has been more deserving of this award." Click here to watch Tyson receive his award! The Impact Player of the Month Award is given to an individual who has impacted their team in a positive way, both on and off the field. Nominations will be accepted from any high school that reports scores to CSZ year-round, and can be submitted by parents, coaches, teachers or fellow students. To nominate a student-athlete, contact Wick Eisenberg at weisenberg@countysportszone.com with a message featuring a subject line of "US Army Impact Player Nomination." Each honoree will receive a custom trophy from Crown Trophy and the opportunity for a videotaped award presentation at their school with a member of the U.S. Army.